City Hall of San Marino. The official building name is “Palazzo Pubblico di San Marino”. In the palace is located the Captains Regent residence, the government and the town hall of the San Marino. The Palace hosts a variety of official events. 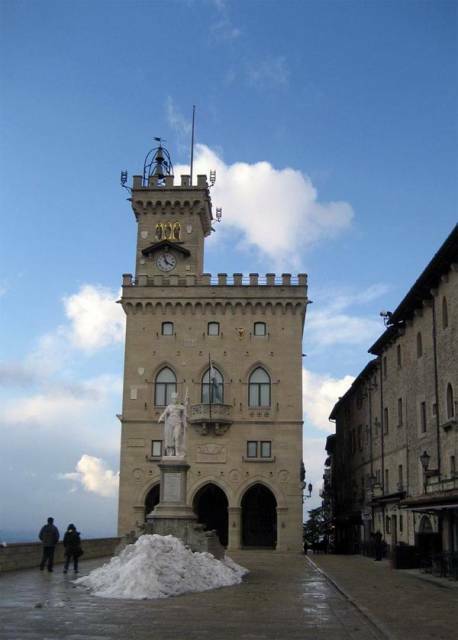 The building is located in the center of San Marino, in the “Piazza della Libertà” square. The building was constructed in 1884 - 1894 by the architect Francesco Azzurri, on the site of an ancient building called the “Domus Magna Comunis”. Grand opening of the palace took place September 30, 1894. In the center of the facade is a balcony from which announce the Captains Regents names. In the vestibule of the palace is a ceramic triptych depicting three saints’ patrons of the Republic: San Marino, San Quirino and Sant Agata. Next to the palace is a bronze statue of the founder of the Republic of San Marino (San Marino diacono). Photo was taken in February 2013, during a trip to Italy.